"Digicam" redirects here. For the military camouflage method using micropatterns, see Digital camouflage. A digital camera or digicam is a camera that captures photographs in digital memory. Most cameras produced today are digital,  and while there are still dedicated digital cameras, many more cameras are now being incorporated into mobile devices, portable touchscreen computers, which can, among many other purposes, use their cameras to initiate live videotelephony and directly edit and upload imagery to others. However, high-end, high-definition dedicated cameras are still commonly used by professionals. Digital and movie cameras share an optical system, typically using a lens with a variable diaphragm to focus light onto an image pickup device. The diaphragm and shutter admit the correct amount of light to the imager, just as with film but the image pickup device is electronic rather than chemical. However, unlike film cameras, digital cameras can display images on a screen immediately after being recorded, and store and delete images from memory. 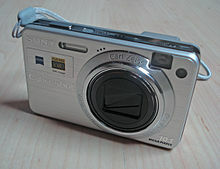 Many digital cameras can also record moving videos with sound. Some digital cameras can crop and stitch pictures and perform other elementary image editing. The history of the digital camera began with Eugene F. Lally of the Jet Propulsion Laboratory, who was thinking about how to use a mosaic photosensor to capture digital images. His 1961 idea was to take pictures of the planets and stars while travelling through space to give information about the astronauts' position. As with Texas Instruments employee Willis Adcock's filmless camera (US patent 4,057,830) in 1972, the technology had yet to catch up with the concept. The Cromemco Cyclops was an all-digital camera introduced as a commercial product in 1975. Its design was published as a hobbyist construction project in the February 1975 issue of Popular Electronics magazine, and it used a 32×32 Metal Oxide Semiconductor sensor. In 2000, Sharp introduced the world's first digital camera phone, the J-SH04 J-Phone, in Japan. By the mid-2000s, higher-end cell phones had an integrated digital camera. By the beginning of the 2010s, almost all smartphones had an integrated digital camera. The resolution of a digital camera is often limited by the image sensor  that turns light into discrete signals. The brighter the image at a given point on the sensor, the larger the value that is read for that pixel. Depending on the physical structure of the sensor, a color filter array may be used, which requires demosaicing to recreate a full-color image. The number of pixels in the sensor determines the camera's " pixel count". In a typical sensor, the pixel count is the product of the number of rows and the number of columns. For example, a 1,000 by 1,000 pixel sensor would have 1,000,000 pixels, or 1 megapixel. At the heart of a digital camera is a CCD or a CMOS image sensor. Digital camera, partly disassembled. The lens assembly (bottom right) is partially removed, but the sensor (top right) still captures an image, as seen on the LCD screen (bottom left). Since the first digital backs were introduced, there have been three main methods of capturing the image, each based on the hardware configuration of the sensor and color filters. Single-shot capture systems use either one sensor chip with a Bayer filter mosaic, or three separate image sensors (one each for the primary additive colors red, green, and blue) which are exposed to the same image via a beam splitter (see Three-CCD camera). Multi-shot exposes the sensor to the image in a sequence of three or more openings of the lens aperture. There are several methods of application of the multi-shot technique. The most common originally was to use a single image sensor with three filters passed in front of the sensor in sequence to obtain the additive color information. Another multiple shot method is called Microscanning. This method uses a single sensor chip with a Bayer filter and physically moved the sensor on the focus plane of the lens to construct a higher resolution image than the native resolution of the chip. A third version combined the two methods without a Bayer filter on the chip. The third method is called scanning because the sensor moves across the focal plane much like the sensor of an image scanner. The linear or tri-linear sensors in scanning cameras utilize only a single line of photosensors, or three lines for the three colors. Scanning may be accomplished by moving the sensor (for example, when using color co-site sampling) or by rotating the whole camera. A digital rotating line camera offers images of very high total resolution. Improvements in single-shot cameras and image file processing at the beginning of the 21st century made single shot cameras almost completely dominant, even in high-end commercial photography. The Bayer arrangement of color filters on the pixel array of an image sensor. Most current consumer digital cameras use a Bayer filter mosaic in combination with an optical anti-aliasing filter to reduce the aliasing due to the reduced sampling of the different primary-color images. A demosaicing algorithm is used to interpolate color information to create a full array of RGB image data. Cameras that use a beam-splitter single-shot 3CCD approach, three-filter multi-shot approach, color co-site sampling or Foveon X3 sensor do not use anti-aliasing filters, nor demosaicing. Firmware in the camera, or a software in a raw converter program such as Adobe Camera Raw, interprets the raw data from the sensor to obtain a full color image, because the RGB color model requires three intensity values for each pixel: one each for the red, green, and blue (other color models, when used, also require three or more values per pixel). A single sensor element cannot simultaneously record these three intensities, and so a color filter array (CFA) must be used to selectively filter a particular color for each pixel. The Bayer filter pattern is a repeating 2x2 mosaic pattern of light filters, with green ones at opposite corners and red and blue in the other two positions. The high proportion of green takes advantage of properties of the human visual system, which determines brightness mostly from green and is far more sensitive to brightness than to hue or saturation. Sometimes a 4-color filter pattern is used, often involving two different hues of green. This provides potentially more accurate color, but requires a slightly more complicated interpolation process. The color intensity values not captured for each pixel can be interpolated from the values of adjacent pixels which represent the color being calculated. Cameras with digital image sensors that are smaller than the typical 35mm film size have a smaller field or angle of view when used with a lens of the same focal length. This is because angle of view is a function of both focal length and the sensor or film size used. The crop factor is relative to the 35mm film format. If a smaller sensor is used, as in most digicams, the field of view is cropped by the sensor to smaller than the 35mm full-frame format's field of view. This narrowing of the field of view may be described as crop factor, a factor by which a longer focal length lens would be needed to get the same field of view on a 35mm film camera. Full-frame digital SLRs utilize a sensor of the same size as a frame of 35mm film. Common values for field of view crop in DSLRs using active pixel sensors include 1.3x for some Canon (APS-H) sensors, 1.5x for Sony APS-C sensors used by Nikon, Pentax and Konica Minolta and for Fujifilm sensors, 1.6 (APS-C) for most Canon sensors, ~1.7x for Sigma's Foveon sensors and 2x for Kodak and Panasonic 4/3-inch sensors currently used by Olympus and Panasonic. Crop factors for non-SLR consumer compact and bridge cameras are larger, frequently 4x or more. Relative sizes of sensors used in most current digital cameras. Digital cameras come in a wide range of sizes, prices and capabilities. In addition to general purpose digital cameras, specialized cameras including multispectral imaging equipment and astrographs are used for scientific, military, medical and other special purposes. Compact cameras are intended to be portable (pocketable) and are particularly suitable for casual " snapshots". Many incorporate a retractable lens assembly that provides optical zoom. In most models, an auto actuating lens cover protects the lens from elements. Most ruggedized or water-resistant models do not retract, and most with superzoom capability do not retract fully. Compact cameras are usually designed to be easy to use. Almost all include an automatic mode, or "auto mode", which automatically makes all camera settings for the user. Some also have manual controls. Compact digital cameras typically contain a small sensor which trades-off picture quality for compactness and simplicity; images can usually only be stored using lossy compression ( JPEG). Most have a built-in flash usually of low power, sufficient for nearby subjects. A few high end compact digital cameras have a hotshoe for connecting to an external flash. Live preview is almost always used to frame the photo on an integrated LCD. In addition to being able to take still photographs almost all compact cameras have the ability to record video. Compacts often have macro capability and zoom lenses, but the zoom range (up to 30x) is generally enough for candid photography but less than is available on bridge cameras (more than 60x), or the interchangeable lenses of DSLR cameras available at a much higher cost. Autofocus systems in compact digital cameras generally are based on a contrast-detection methodology using the image data from the live preview feed of the main imager. Some compact digital cameras use a hybrid autofocus system similar to what is commonly available on DSLRs. Typically, compact digital cameras incorporate a nearly silent leaf shutter into the lens but play a simulated camera sound  for skeuomorphic purposes. For low cost and small size, these cameras typically use image sensor formats with a diagonal between 6 and 11 mm, corresponding to a crop factor between 7 and 4. This gives them weaker low-light performance, greater depth of field, generally closer focusing ability, and smaller components than cameras using larger sensors. Some cameras use a larger sensor including, at the high end, a pricey full-frame sensor compact camera, such as Sony Cyber-shot DSC-RX1, but have capability near that of a DSLR. Starting in 2011, some compact digital cameras can take 3D still photos. These 3D compact stereo cameras can capture 3D panoramic photos with dual lens or even single lens for play back on a 3D TV. Rugged compact cameras typically include protection against submersion, hot and cold conditions, shock and pressure. Terms used to describe such properties include waterproof, freezeproof, heatproof, shockproof and crushproof, respectively. Nearly all major camera manufacturers have at least one product in this category. Some are waterproof to a considerable depth up to 82 feet (27 m);  others only 10 feet (3m), but only a few will float. Ruggeds often lack some of the features of ordinary compact camera, but they have video capability and the majority can record sound. Most have image stabilization and built-in flash. Touchscreen LCD and GPS do not work under water. GoPro and other brands offer action cameras which are rugged, small and can be easily attached to helmet, arm, bicycle, etc. Most have wide angle and fixed focus, and can take still pictures and video, typically with sound. Bridge cameras physically resemble DSLRs, and are sometimes called DSLR-shape or DSLR-like. They provide some similar features but, like compacts, they use a fixed lens and a small sensor. Some compact cameras have also PSAM mode. Most use live preview to frame the image. Their usual autofocus is by the same contrast-detect mechanism as compacts, but many bridge cameras have a manual focus mode and some have a separate focus ring for greater control. Big physical size and small sensor allow superzoom and wide aperture. Bridge cameras generally include an image stabilization system to enable longer handheld exposures, sometimes better than DSLR for low light condition. As of 2014, bridge cameras come in two principal classes in terms of sensor size, firstly the more traditional 1/2.3" sensor (as measured by image sensor format) which gives more flexibility in lens design and allows for handholdable zoom from 20 to 24mm (35mm equivalent) wide angle all the way up to over 1000 mm supertele, and secondly a 1" sensor that allows better image quality particularly in low light (higher ISO) but puts greater constraints on lens design, resulting in zoom lenses that stop at 200mm (constant aperture, e.g. Sony RX10) or 400mm (variable aperture, e.g. Panasonic Lumix FZ1000) equivalent, corresponding to an optical zoom factor of roughly 10 to 15. Some bridge cameras have a lens thread to attach accessories such as wide-angle or telephoto converters as well as filters such as UV or Circular Polarizing filter and lens hoods. The scene is composed by viewing the display or the electronic viewfinder (EVF). Most have a slightly longer shutter lag than a DSLR. Many of these cameras can store images in a raw format in addition to supporting JPEG. The majority have a built-in flash, but only a few have a hotshoe. While most digital cameras with interchangeable lenses feature a lens-mount of some kind, there are also a number of modular cameras, where the shutter and sensor are incorporated into the lens module. The first such modular camera was the Minolta Dimâge V in 1996, followed by the Minolta Dimâge EX 1500 in 1998 and the Minolta MetaFlash 3D 1500 in 1999. In 2009, Ricoh released the Ricoh GXR modular camera. There are also a number of add-on camera modules for smartphones, they are called lens-style cameras (lens camera or smart lens). They contain all the essential components of a digital camera inside a DSLR lens-shaped module, hence the name, but lack any sort of viewfinder and most controls of a regular camera. Instead, they are connected wirelessly and/or mounted to a smartphone to be used as its display output and operate the camera's various controls. Sony Cyber-shot QX series "Smart Lens" camera, announced and released in mid 2013 with the Cyber-shot DSC-QX10. In January 2014, a firmware update was announced for the DSC-QX10 and DSC-QX100. In September 2014, Sony announced the Cyber-shot DSC-QX30 as well as the Alpha ILCE-QX1,   the former an ultrazoom with a built-in 30x optical zoom lens, the latter opting for an interchangeable Sony E-mount instead of a built-in lens. Digital single-lens reflex cameras (DSLR) use a reflex mirror that can reflect the light and also can swivel from one position to another position and back to initial position. By default, the reflex mirror is set 45 degree from horizontal, blocks the light to the sensor and reflects light from the lens to penta-mirror/prism at the DSLR camera and after some reflections arrives at the viewfinder. The reflex mirror is pulled out horizontally below the penta-mirror/prism when shutter release is fully pressed, so the viewfinder will be dark and the light/image can directly strike the sensor at the time of exposure (speed setting). Autofocus is accomplished using sensors in the mirror box. Some DSLRs have a " live view" mode that allows framing using the screen with image from the sensor. These cameras have much larger sensors than the other types, typically 18 mm to 36 mm on the diagonal (crop factor 2, 1.6, or 1). The larger sensor permits more light to be received by each pixel; this, combined with the relatively large lenses provides superior low-light performance. For the same field of view and the same aperture, a larger sensor gives shallower focus. They use interchangeable lenses for versatility. Usually some lenses are made for digital SLR use only, but recent trend the lenses can also be used in detachable lens video camera with or without adapter. A rangefinder is a device to measure subject distance, with the intent to adjust the focus of a camera's objective lens accordingly ( open-loop controller). The rangefinder and lens focusing mechanism may or may not be coupled. In common parlance, the term "rangefinder camera" is interpreted very narrowly to denote manual-focus cameras with a visually-read out optical rangefinder based on parallax. Most digital cameras achieve focus through analysis of the image captured by the objective lens and distance estimation, if it is provided at all, is only a byproduct of the focusing process ( closed-loop controller). A San Francisco cable car, imaged using an Alkeria Necta N4K2-7C line scan camera with a shutter speed of 250 microseconds, or 4000 frames per second. A line-scan camera traditionally has a single row of pixel sensors, instead of a matrix of them. The lines are continuously fed to a computer that joins them to each other and makes an image. This is most commonly done by connecting the camera output to a frame grabber which resides in a PCI slot of an industrial computer. The frame grabber acts to buffer the image and sometimes provide some processing before delivering to the computer software for processing. Multiple rows of sensors may be used to make colored images, or to increase sensitivity by TDI ( Time delay and integration). Many industrial applications require a wide field of view. Traditionally maintaining consistent light over large 2D areas is quite difficult. With a line scan camera all that is necessary is to provide even illumination across the “line” currently being viewed by the camera. This makes possible sharp pictures of objects that pass the camera at high speed. Such cameras are also commonly used to make photo finishes, to determine the winner when multiple competitors cross the finishing line at nearly the same time. They can also be used as industrial instruments for analyzing fast processes. Linescan cameras are also extensively used in imaging from satellites (see push broom scanner). In this case the row of sensors is perpendicular to the direction of satellite motion. Linescan cameras are widely used in scanners. In this case, the camera moves horizontally. Many devices have a built-in digital camera, including, for example, smartphones, mobile phones, PDAs and laptop computers. Built-in cameras generally store the images in the JPEG file format. Light-field cameras were introduced in 2013 with one consumer product and several professional ones. Early cameras used the PC serial port. USB is now the most widely used method (most cameras are viewable as USB mass storage), though some have a FireWire port. Some cameras use USB PTP mode for connection instead of USB MSC; some offer both modes. Other cameras use wireless connections, via Bluetooth or IEEE 802.11 Wi-Fi, such as the Kodak EasyShare One. Wi-Fi integrated Memory cards (SDHC, SDXC) can transmit stored images, video and other files to computers or smartphones. Mobile operating systems such as Android allow automatic upload and backup or sharing of images over Wi-Fi to photo sharing and cloud services. Cameras with integrated Wi-Fi or specific Wi-Fi adapters mostly allow camera control, especially shutter release, exposure control and more ( tethering) from computer or smartphone apps additionally to the transfer of media data. Cameraphones and some high-end stand-alone digital cameras also use cellular networks to connect for sharing images. The most common standard on cellular networks is the MMS Multimedia Messaging Service, commonly called "picture messaging". The second method with smartphones is to send a picture as an email attachment. Many old cameraphones, however, do not support email. Many modern cameras support the PictBridge standard, which allows them to send data directly to a PictBridge-capable computer printer without the need for a computer. Wireless connectivity can also provide for printing photos without a cable connection. Many digital cameras include a video output port. Usually sVideo, it sends a standard-definition video signal to a television, allowing the user to show one picture at a time. Buttons or menus on the camera allow the user to select the photo, advance from one to another, or automatically send a "slide show" to the TV. HDMI has been adopted by many high-end digital camera makers, to show photos in their high-resolution quality on an HDTV. Some DVD recorders and television sets can read memory cards used in cameras; alternatively several types of flash card readers have TV output capability. Cameras can be equipped with a varying amount of environmental sealing to provide protection against splashing water, moisture (humidity and fog), dust and sand, or complete waterproofness to a certain depth and for a certain duration. The latter is one of the approaches to allow underwater photography, the other approach being the use of waterproof housings. Many waterproof digital cameras are also shockproof and resistant to low temperatures. Some waterproof cameras can be fitted with a waterproof housing to increase the operational depth range. The Olympus 'Tough' range of compact cameras is an example. Many digital cameras have preset modes for different applications. Within the constraints of correct exposure various parameters can be changed, including exposure, aperture, focusing, light metering, white balance, and equivalent sensitivity. For example, a portrait might use a wider aperture to render the background out of focus, and would seek out and focus on a human face rather than other image content. Many camera phones and most stand alone digital cameras store image data in flash memory cards or other removable media. Most stand-alone cameras use SD format, while a few use CompactFlash or other types. In January 2012, a faster XQD card format was announced. In early 2014, some high end cameras have two hot-swapable memory slots. Photographers can swap one of the memory card with camera-on. Each memory slot can accept either Compact Flash or SD Card. All new Sony cameras also have two memory slots, one for its Memory Stick and one for SD Card, but not hot-swapable. Most manufacturers of digital cameras do not provide drivers and software to allow their cameras to work with Linux or other free software. Still, many cameras use the standard USB storage protocol, and are thus easily usable. Other cameras are supported by the gPhoto project. The Joint Photography Experts Group standard (JPEG) is the most common file format for storing image data. Other file types include Tagged Image File Format ( TIFF) and various Raw image formats. Many cameras, especially high-end ones, support a raw image format. A raw image is the unprocessed set of pixel data directly from the camera's sensor, often saved in a proprietary format. Adobe Systems has released the DNG format, a royalty-free raw image format used by at least 10 camera manufacturers. Raw files initially had to be processed in specialized image editing programs, but over time many mainstream editing programs, such as Google's Picasa, have added support for raw images. Rendering to standard images from raw sensor data allows more flexibility in making major adjustments without losing image quality or retaking the picture. Formats for movies are AVI, DV, MPEG, MOV (often containing motion JPEG), WMV, and ASF (basically the same as WMV). Recent formats include MP4, which is based on the QuickTime format and uses newer compression algorithms to allow longer recording times in the same space. Most cameras include Exif data that provides metadata about the picture. Exif data may include aperture, exposure time, focal length, date and time taken, and location. Digital cameras utilize either proprietary or standard consumer batteries. As of March 2014 [update], most cameras use proprietary lithium-ion batteries while some use standard AA batteries or primarily use a proprietary Lithium-ion rechargeable battery pack but have an optional AA battery holder available. The most common class of battery used in digital cameras is proprietary battery formats. These are built to a manufacturer's custom specifications. Almost all proprietary batteries are lithium-ion. In addition to being available from the OEM, aftermarket replacement batteries are commonly available for most camera models. Digital cameras that utilize off-the-shelf batteries are typically designed to be able to use both single-use disposable and rechargeable batteries, but not with both types in use at the same time. The most common off-the-shelf battery size used is AA. CR2, CR-V3 batteries, and AAA batteries are also used in some cameras. The CR2 and CR-V3 batteries are lithium based, intended for a single use. Rechargeable RCR-V3 lithium-ion batteries are also available as an alternative to non-rechargeable CR-V3 batteries. Some battery grips for DSLRs come with a separate holder to accommodate AA cells as an external power source. When digital cameras became common, many photographers asked whether their film cameras could be converted to digital. The answer was yes and no. For the majority of 35 mm film cameras the answer is no, the reworking and cost would be too great, especially as lenses have been evolving as well as cameras. For most a conversion to digital, to give enough space for the electronics and allow a liquid crystal display to preview, would require removing the back of the camera and replacing it with a custom built digital unit. Many early professional SLR cameras, such as the Kodak DCS series, were developed from 35 mm film cameras. The technology of the time, however, meant that rather than being digital "backs" the bodies of these cameras were mounted on large, bulky digital units, often bigger than the camera portion itself. These were factory built cameras, however, not aftermarket conversions. A notable exception is the Nikon E2 and Nikon E3, using additional optics to convert the 35mm format to a 2/3 CCD-sensor. A few 35 mm cameras have had digital camera backs made by their manufacturer, Leica being a notable example. Medium format and large format cameras (those using film stock greater than 35 mm), have a low unit production, and typical digital backs for them cost over $10,000. These cameras also tend to be highly modular, with handgrips, film backs, winders, and lenses available separately to fit various needs. In the industrial and high-end professional photography market, some camera systems use modular (removable) image sensors. 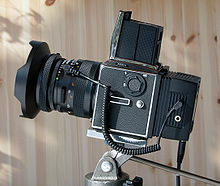 For example, some medium format SLR cameras, such as the Mamiya 645D series, allow installation of either a digital camera back or a traditional photographic film back. Linear array cameras are also called scan backs. Most earlier digital camera backs used linear array sensors, moving vertically to digitize the image. Many of them only capture grayscale images. The relatively long exposure times, in the range of seconds or even minutes generally limit scan backs to studio applications, where all aspects of the photographic scene are under the photographer's control. Some other camera backs use CCD arrays similar to typical cameras. These are called single-shot backs. Since it is much easier to manufacture a high-quality linear CCD array with only thousands of pixels than a CCD matrix with millions, very high resolution linear CCD camera backs were available much earlier than their CCD matrix counterparts. For example, you could buy an (albeit expensive) camera back with over 7,000 pixel horizontal resolution in the mid-1990s. However, as of 2004 [update], it is still difficult to buy a comparable CCD matrix camera of the same resolution. Rotating line cameras, with about 10,000 color pixels in its sensor line, are able, as of 2005 [update], to capture about 120,000 lines during one full 360 degree rotation, thereby creating a single digital image of 1,200 Megapixels. Most modern digital camera backs use CCD or CMOS matrix sensors. The matrix sensor captures the entire image frame at once, instead of incrementing scanning the frame area through the prolonged exposure. For example, Phase One produces a 39 million pixel digital camera back with a 49.1 x 36.8 mm CCD in 2008. This CCD array is a little smaller than a frame of 120 film and much larger than a 35 mm frame (36 x 24 mm). In comparison, consumer digital cameras use arrays ranging from 36 x 24 mm (full frame on high end consumer DSLRs) to 1.28 x 0.96 mm (on camera phones) CMOS sensor. ^ Musgrove, Mike (2006-01-12). "Nikon Says It's Leaving Film-Camera Business". Washington Post. Retrieved 2007-02-23. ^ Prakel, David (10 December 2009). The Visual Dictionary of Photography. AVA Publishing. p. 91. ISBN 978-2-940411-04-7. Retrieved 24 July 2013. ^ Dobbin, Ben. (September 8, 2005) " Kodak engineer had revolutionary idea: the first digital camera." Seattle Post-Intelligencer. Retrieved on 2018-02-06. ^ Estrin, James (August 12, 2015). "Kodak's First Digital Moment". The New York Times. Retrieved February 6, 2018. ^ "Evolution of the Camera phone: From Sharp J-SH04 to Nokia 808 Pureview". Hoista.net. 2012-02-28. Retrieved 2013-06-21. ^ "What Is the Difference Between a CCD and CMOS Video Camera". Retrieved March 26, 2014. ^ a b "Technology: BSI-CMOS, CMOS, CCD… What's the deal". March 26, 2014. ^ Joshua Goldman. "Why the iPhone 4 takes good low-light photos: BSI CMOS sensors explained!". Retrieved September 29, 2014. ^ Bockaert, Vincent. "Sensor sizes". Digital Photography Review. Retrieved 2007-04-03. ^ Ken Rockwell. "Nikon 18-300mm VR DX AF-S G ED NIKKOR, $1,000". Retrieved January 27, 2014. ^ Panasonic DMC FT3 Specification. Cameras.co.uk. Retrieved on 2013-08-16. ^ "Sony DSC-QX100 and QX10 lens cameras bring top-notch optics to any smartphone or tablet, we go hands-on (video)". September 4, 2013. ^ Chris Maxcer. "3 Best Waterproof Cameras for 2015: Rugged, Compact, and Ready for Action". Retrieved February 18, 2015. ^ "Action Camera Market – Global Industry Analysis, Size, Share, Growth, Trends, and Forecast 2016 – 2024". Retrieved April 2, 2017. ^ Simon Crisp (July 19, 2016). "Big plans for "world's smallest" 360-degree camera". ^ Sean O'Kane (January 9, 2016). "Nikon's new action camera could change the market in a big way This is the year action cameras and 360-degree videos collide". ^ JPEG is a lossy compression format with less colour depth than typical of raw formats; however, most raw formats require demosaicing ("raw converter") software to be viewed properly. ^ Gannon Burgnett. "What's a mirrorless camera and what makes it different from a DSLR?". Digital Trends. Retrieved February 16, 2019. ^ Andy Westlake (September 15, 2016). "The rise of mirrorless compact system cameras". ^ Andy Westlake. "Kodak Pixpro S-1 First Impressions Review". Retrieved September 30, 2014. ^ Lawler, Richard (March 13, 2014). "Nikon 1 V3 camera unveiled: $1,200, 120fps slow motion, 20fps continuous shooting". Engadget. AOL. Archived from the original on March 20, 2014. Retrieved March 19, 2014. ^ "Polaroid offers first Android camera with interchangeable lenses". January 8, 2013. ^ Mariella Moon (January 31, 2014). "Sony upgrades smartphone-pairing QX10 and QX100 lens cameras with higher ISO and 1080p video capture". ^ "Sony introduces QX1 with APS-C sensor and E-mount for smartphones". September 3, 2014. ^ "Smartphone-Kameramodule QX1 und QX30 von Sony (aktualisiert)". ^ Simon Crisp (January 18, 2014). "Kodak smart lens cameras try to take on Sony". ^ "Sakar shows QX-style, Vivitar-branded modular smart camera". January 14, 2014. ^ Edgar Alvarez (February 5, 2015). "Olympus Air is a lens camera that pairs with your smartphone". ^ Michael Zhang. "Olympus Showing Off New 'Lens Camera' Prototypes with a Rounded Design". Retrieved February 9, 2015. ^ Brad Molen (October 8, 2014). "HTC's RE camera is a GoPro for NoPros". ^ a b "Smile, and Say 'Android'". New York Times. Retrieved 22 August 2013. ^ "Bridge cameras a growing market says Canon and Nikon". February 20, 2013. ^ "The Future of Digital Cameras". Retrieved February 27, 2013. ^ "Nokia Lumia 1020 preview: Take two". GSMArena. Retrieved 22 August 2013. ^ "Nokia Lumia 1020 vs. Galaxy S4 Zoom: The Best Camera Phone Is…". Laptop. Retrieved 24 August 2013. ^ Lars Rehm (September 15, 2014). "Panasonic announces Lumix DMC-CM1 smartphone with 1-inch sensor". ^ "Huawei P20 Pro". Retrieved July 6, 2018. ^ Andy Boxall (June 4, 2018). "Huawei P20 Pro review". ^ Andrew Reid (26 October 2013). "Consumer DSLRs "dead in 5 years"". Retrieved December 30, 2013. ^ "Worldwide unit sales of digital cameras from 2011 to 2016 (in millions)". Retrieved March 28, 2017. ^ Thomas Stirr (April 2, 2016). "DIGITAL CAMERA SALES CONTINUED TO DECLINE IN 2015". Retrieved October 31, 2016. ^ William Sawalich (2016-03-28). "Options For Instant-Print Cameras". Digital Photo Magazine. ^ "Reinventing Instant Photography for the Digital Age". Polaroid. January 8, 2009. Archived from the original on 2009-01-21. Retrieved 2009-01-15. ^ "Mobile High-Definition Link Technology Gives Consumers the Ability to Link Mobile Devices to HDTVs with Support for Audio and Video". Silicon Image. January 7, 2008. Retrieved 2009-01-15. ^ "Sony Announces World's First XQD Memory Cards". Retrieved January 8, 2012. ^ JEIDA/JEITA/CIPA (2010). "Standard of the Camera & Imaging Products Association, CIPA DC-009-Translation-2010, Design rule for Camera File system: DCF Version 2.0 (Edition 2010)" (PDF). Archived from the original (PDF) on 2013-09-30. Retrieved 2011-04-13. Wikimedia Commons has media related to Digital cameras.